The VB Esbjerg covered the complete city of Esbjerg plus the island of Fanø and the airfield near the city. The lists give us almost 280 St bunkers, an enormous amount of which, unfortunately, a large part has been demolished because of the city's growth. However, between houses, and covered by earth there're still a lot of bunkers to be found. Eyecatchers are the MarKo complex near the town center, the FlaGruKo complex in the park, the defences of Fanø, the airfield and the remains of the Landfront with two MG turrets still there. We can only cover a small part now. 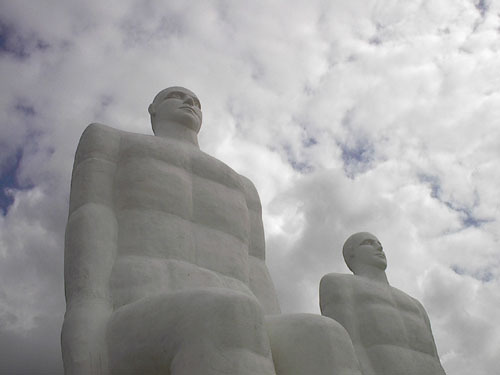 A huge sculpture made by Sven Wiig Hansen at Stp Sædding.